Tea Jay was named President & CEO of the Chamber and its affiliates in October 2017. She was previously the Finance & Membership Director and Executive Assistant. Hired in March of 2011, Tea Jay often utilizes her experience in manufacturing, marketing and customer service. She owes her success to being extremely organized, highly motivated and a dedicated self-starter. Tea Jay graduated from the Milton Area High School and worked at the Rockwell Retirement Center & Grand Candlelight Theatre in Milton during her senior year. That is where she started to receive honors in the work place such as the You Make a Difference Award, Employee of the Month and Unscene Hero. She also represented the Fifth Ward Hose Company as a contestant in the Milton Harvest Festival Princess Pageant many years ago. Tea Jay has been involved with the Northumberland County Special Olympics bowling program in several capacities over the years. She volunteered, coached and bowled on unified teams at tournaments and during the Summer Games at Penn State. She finds the athletes to be amazing individuals who love life and appreciate the small things that we all sometimes take for granted. She has made an annual tradition spending Christmas volunteering at Mostly Mutts, a local no-kill dog shelter. She is compassionate and committed to helping others, which makes her job with the Central PA Chamber a perfect fit. 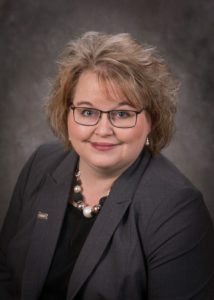 She has served as an Area Director for Toastmasters International and VP of Public Relations for the Greater Susquehanna Valley Toastmasters International club. Currently, she is serving on the advisory board of the local Salvation Army of whom she annually dedicates a day to work the Red Kettle Campaign. She has used her leadership and public speaking skills to work with a local federal prison assisting in preparing inmates for re-entry to society and the workforce. She has a great love of animals and gives a home to those in need more often than not. She dreams to one day own and operate her own no-kill animal sanctuary. Some might say she is well on her way, currently housing multiple dogs, cats, goats, chickens and an occasional duck or two. When not working or caring for animals, Tea Jay enjoys spending time with friends and the simple things like live music, cold drinks and hot wings. Tea Jay, who lives near Mifflinburg, is a huge fan of Bucknell University Men’s Basketball, and hardly ever misses a home game and travels to cheer on the Bison whenever she can. She even has a “Bison” room in her home.